Lemon (Citrus limon) is a short, bushy, aromatic shrub rich in culinary as well as medicinal properties. It is an effective remedy against various health ailments such as high blood pressure, varicose veins, inflammation, hemorrhoids, kidney stones, indigestion, weight loss, and many more. Lemon is a rich source carbohydrates (11 g), proteins (1 g), fats, (0.9 g), vitamin C (39 mg), magnesium (373 mg), potassium (270 mg), calcium (70 mg), phosphorus (10 mg) and fibers (1.7 g). Lemon juice helps your body improve digestion, treats heartburn and stimulates bile production. Since lemon juice helps to improve treat indigestion, aids in removal of toxins, and increases our energy levels, this all combines together to help lose body fat as well through improving the hormonal balance of the body. In the morning, drinking a glass of lukewarm water with a few drops of lemon juice aids digestion and improves bowel movement. Lemon can be used as an effective remedy for weight loss. Add to a warm glass of water, a tsp of honey & lemon juice each. Take this preparation on an empty stomach early in the morning. 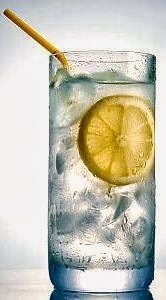 Another remedy for weight loss is to mix a tsp of lemon juice with 1/4th tsp of ginger juice in a glass of warm water. Take this formulation early in the morning. These remedies not only aid weight loss, but are also helpful for those suffering from constipation and indigestion. There are yet other reasons to add warm lemon water to your daily morning routine. Lemon has the detoxifying and the alkalizing effect which can boost up the energy levels through removal of toxins from the body. Also, it is said to improve your mood by reducing stress and anxiety. When it comes to weight loss, it all comes down to eating fewer calories than your body needs. Oats can be part of your weight loss plan and can be consumed either at breakfast or as a snack. Oats are edible seeds of the Avena sativa plant. These are used for human consumption as oatmeal and rolled oats. Oatmeal is the perfect meal to start your day because it boosts your energy and has plenty of fiber to keep you full and satisfied. Oatmeal is also full of water-soluble fibers, which play a crucial role in making you feel full over a longer period of time. Studies have also shown that oatmeal reduces cholesterol, maintains blood sugar levels and fights against heart disease, diabetes, colon cancer, and obesity. Also, oats are high in phytonutrients, beta-glucans, selenium, proteins, manganese, iron, thiamin and magnesium. By itself, oatmeal is low in fat and fairly low in calories. Eating oatmeals 1-2 hours before workouts will give you a longer lasting blast of energy that helps workout longer & more intensely which helps you lose weight much faster! All types of oatmeal are healthful and low-fat, but steel-cut oats are less processed than rolled oats and are believed to retain more nutrients. Packets of instant oatmeal often contain more sugar than oats you cook yourself. Regardless of the type of oatmeal you choose to eat, be careful of what you add to your bowl. Choose skim milk to keep the calories low. 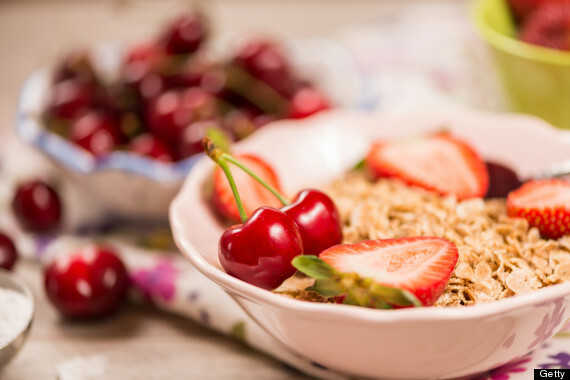 Instead of sweetening your oatmeal with sugar, try berries or dried fruit, which also offer additional fiber and nutrients.